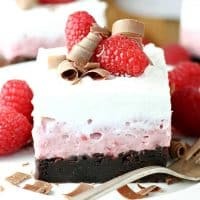 CHOCOLATE RASPBERRY DREAM BARS — Layers of chocolate brownie, raspberry mousse and whip cream combine in a beautiful dessert bar. Perfect for Valentine’s Day! 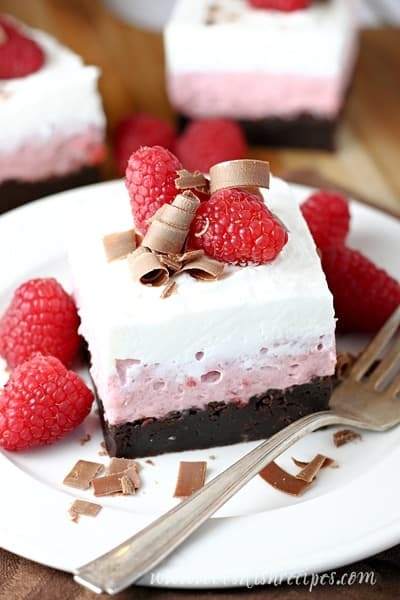 I can’t resist a dessert with lots of delicious layers, not to mention, any kind of chocolate and raspberry combination, so when I say these Chocolate Raspberry Dream bars are my kind of dessert, I’m not kidding! The bottom layer is a rich, chewy chocolate brownie. Next comes a layer of raspberry cheesecake mousse, followed by a layer of homemade, sweetened whipped cream. And a garnish of fresh raspberries and chocolate shavings is always a nice touch. What’s not to love about that? I’m telling you, if you want to win someone’s heart with a delicious homemade dessert this Valentine’s Day, make them these decadent raspberry and chocolate bars! This is a show-stopper dessert that is sure to impress! 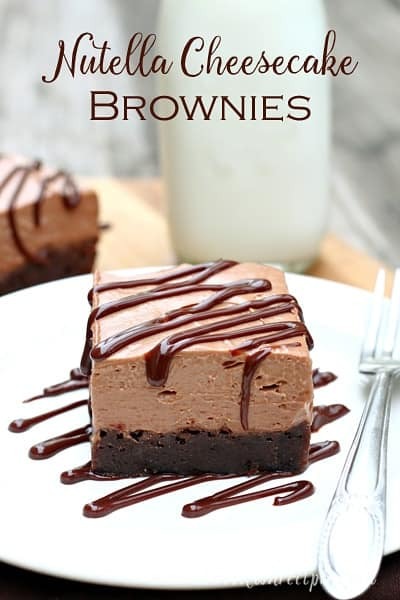 Of course, I would gladly eat this dessert on Valentine’s Day or any day of the year! And they really aren’t hard to make. Honestly, waiting for each layer to cool or set up was the hardest part. I love how beautifully these bars set up and slice too! Because of the raspberry and whipped cream layers, you’ll want to store this dessert in the refrigerator, but it’s much easier to slice and eat if you let it stand at room temperature for about ten minutes first. Trust me, you’re going to love this pretty layered dessert! It’s the perfect end to a romantic dinner, or any special occasion. 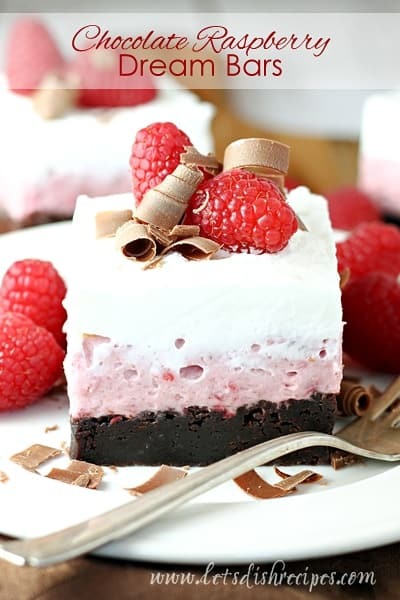 Be sure to save this Chocolate Raspberry Dream Bars recipe to your favorite Pinterest board for later. 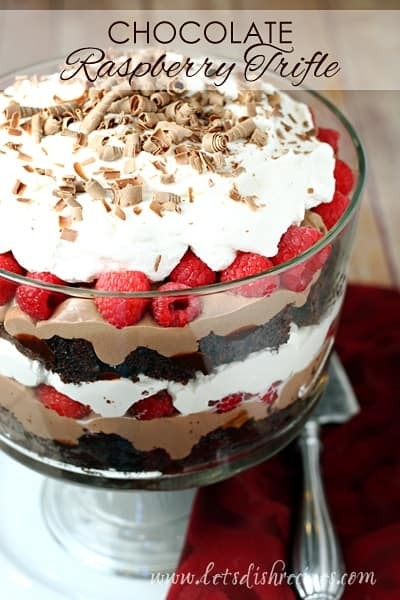 Layers of chocolate brownie, raspberry mousse and whip cream combine in a beautiful dessert bar. Perfect for Valentine's Day! Meanwhile, make raspberry and whipped cream layers. With an electric mixer on high speed, beat the cream cheese, raspberry pie filling, 1/4 cup sugar and lemon juice in a large bowl until well combined. Mix in the fresh raspberries (you want the raspberries to break apart when you mix them in). In a separate bowl, beat the cream and remaining 2 tablespoons sugar on high speed until stiff peaks form. Fold 1 cup of the whipped cream into the raspberry mixture, refrigerate the remaining whipped cream. Spread the raspberry mixture evenly over the cooled brownies. Chill for at least 30 minutes, then spread the remaining whipped cream over the raspberry layer. Refrigerate for at least 4 hours, or until set. Cut into squares and serve. 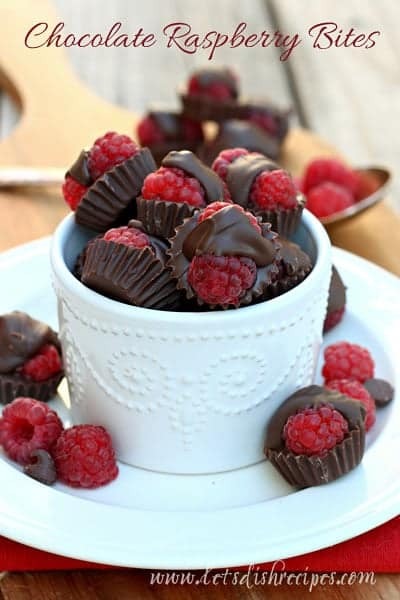 Garnish with chocolate shavings and fresh raspberries, if desired. Store leftover bars covered, in the refrigerator. Do you have any suggestions for converting this to a 13×9 baking dish? I would just double the recipe. These were so delicious!! I made them for our Valentine’s Day dessert, and we all loved them!! !